Wash apples well and remove stems. Cut apples into quarters or eighths and remove cores. Combine unpeeled apples and cider in 8-quart saucepan. Cook slowly and stir occasionally to prevent sticking. Cook until apples are very soft (falling apart). Combine pulp with sucralose and spices in an 8-quart saucepan. Simmer over low heat, stirring frequently. 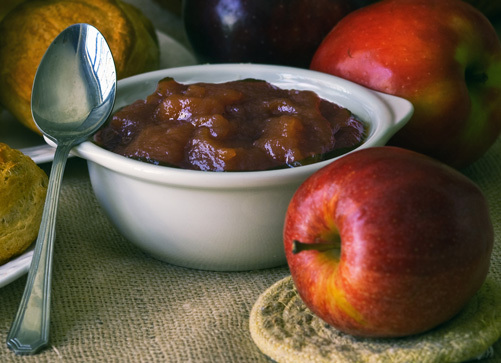 Fill hot apple butter into clean hot jars, leaving ¼-inch headspace. Process in a boiling water or pressure canner according to the recommendations. Let cool, undisturbed, 12-24 hours and check for seals.